We’ve finally arrived at the last entries into the Superstar Collection DVD series. While these DVD’s have not exactly set the world on fire, there still have been some solid matches released on compilation sets for the first time, and a few of the DVD’s have been pretty solid packages. The final two releases, spotlighting Shawn Michaels and Rey Mysterio, felt like the most superfluous sets yet. In turn, this has probably ended up being one of the more difficult reviews to write. I don’t think there’s much of an argument to be made against the in-ring work from Michaels and Mysterio. They both have always put on great matches. However, simply being a collection of good to great matches isn’t all that goes into making a cohesive DVD. While you certainly get some good matches across these two DVD’s, the lack of narrative to the matches really hurts the flow. Each of these DVD’s are rated TV-PG. The Michaels DVD runs about 90 minutes, and the Mysterio DVD runs about 80 minutes. I’m sure you’re all sick of reading my thoughts on these DVD’s in general by now, but in case you are new to these reviews, here is what I said about the format in my Bryan/Sheamus review: “To review the key points, though, the biggest problem with the Superstar Collection DVD’s are the packaging, the menus, and the short introductions. In these areas, you really notice that these DVD’s are budget DVD’s, and they come across as pretty cheap. The only advantage is that the boxes at least have the same overall artwork, and when they are all released, they will look good together on a shelf. The brief introductions to the DVD are pretty generic; they give a decent idea of who the overall character is, but don’t really give us any details of the superstar’s history.” On past DVD sets, the brief introductions gave you some sense of each of the characters. The Michaels and Mysterio intros were even more generic than usual. The only thing I can remember about either of them is that the Mysterio one promoted his Mexican heritage. That’s pretty much it. If you read the description on the back of the Michaels DVD, it sounds like there is a great idea behind this DVD. They mention spotlighting the final “run” of Michaels’ career leading up to WrestleMania XXVI. Unfortunately, the match choices never live up to this promise. The first match chosen takes place in May of 2008, the next match in August 2009, and the final two matches on the set are from March of 2010. Although the 2008 match is a great one, I would have preferred if the matches chosen on this DVD were all from late 2009 to early 2010. This would have given the DVD a great narrative. 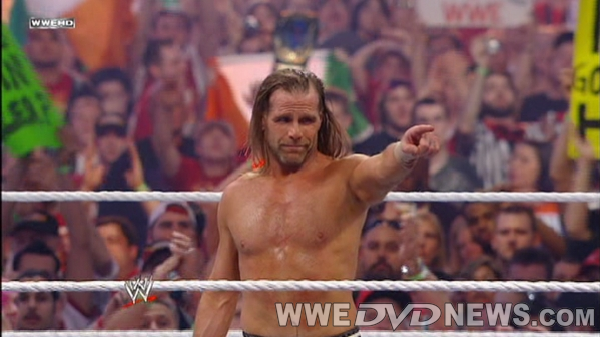 Since none of the matches from his final run are featured on the previously released Shawn Michaels: My Journey set, it also would have helped set this new DVD apart from his old releases. I was pretty disappointed the DVD didn’t live up the advertisement. At least there is some sort of fabricated narrative to attach to the Michaels set. Try as I might, I really can’t come up with any type of narrative that threads together the different Mysterio matches. I guess this is somewhat similar to the Kofi DVD; it just shows how stagnant his career has been since 2009. He’s had plenty of matches fighting over mid-card titles, but the matches weren’t all that significant. Fortunately, we do get to look back at Mysterio’s two best feuds from the past 5 years: his feuds with Jericho and Batista. Both led to very emotional match payoffs, so it is fun to revisit those. You’re getting some decent content, but there’s not much holding it all together. It seems that Michaels and Jericho just aren’t capable of having a bad match together. This match is no different. I like the idea of DX being used to help get some younger talents over. However, I don’t think Rhodes & DiBiase were quite ready to be having main-event level matches at the time, and as good as HBK & HHH may be, they can’t elevate this match past the “very good” level. Shawn’s final Raw match, and a match that helps set up his contest with The Undertaker well. Although the match itself is short and pretty unimpressive, I still appreciated its inclusion in setting up the Streak Vs. Career match. As expected, Mysterio and Jericho put on a great technical contest, but it’s the emotions that push this match to greatness. This is especially impressive from Mysterio, who is able to convey great emotions and storytelling even while wearing a mask. Much like the match with Legacy on the Michaels DVD, this match took place before Ziggler really made “the jump” to great in-ring worker. Still a solid contest, with Ziggler showing a lot of promise. I was a huge fan of the Batista/Mysterio feud. They played off each other really well. This match doesn’t come anywhere near their street fight from Smackdown, but it’s still decent. I felt too much time was spent with Mysterio trying to escape the cage, which got repetitive. The “Superstar Collection” series was an interesting experiment on the part of the WWE, and overall, it wasn’t all that successful from a creative standpoint. There are a few good matches I was able to get on DVD for the first time, but it wasn’t enough to really justify the overall price tag (with the exceptions being the Sheamus & Bryan collections). The Mysterio & Michaels collections represented this dichotomy very well. While there are some great matches featured on each DVD, they don’t really have a reason to exist. Also, in the case of these two collections in particular, most of the really good matches have already been released on other compilation DVD’s. This makes the collections even more pointless. Unless you are a major fan of one of the two superstars, I can’t recommend these DVD’s for any purpose other than completing the collection. Australia fans can also grab them over at WWEDVD.com.au. Anyone heard any news about the U.S release yet? Checking back to see if there is any news as to why these two can not be found in U.S. stores? Don’t feed me these DVD’s! biggest waste of money i have ever seen. He left moved on, for crazy reasons but I do agree with Brett that Macho Man should be in the WWE Hall of Fame but Macho Man said he wants his family inducted together. Joe might’ve started watching in 2002 or so but he better not bury nWo because he missed a great time in wrestling history. I do think everyone deserves a second chance though but if I was DB I would let Brett come back on a trail basis but if he gets out of line get rid of him. Jeff Hardy is the TNA champ and this 6th time he finally is off drugs good for him big Jeff fan. I don’t really understand the thought that I will “bury” something because I didn’t watch it live. Quite frankly, I can give it a more objective review coming at it without any nostalgia factoring in. But seriously, we don’t need him back (though I appreciate the efforts of all past contributors). If there is demand for it, Joe can review older sets. I think an occasional ‘retro review’ would be a welcome addition to the site, mainly for the less covered titles like: Allied Powers, Best of Confidential, Triumph & Tragedy of WCCW, Bobby Heenan, Stars of 80s, etc. Everyone needs to relax about Brett Mix. He turned his back on US and left this site in the dirt. Goes to show DB and Mark didnt need him anyways since they carried on like nothing happened. Bringing back Brett Mix is like bringing back The Ultimate Warrior for another run only for him to run away again while under contract. These two are the end of the line for this series. Too bad, I kind of enjoyed these. Will buy the Shawn Michaels for sure, will be passing on the Mysterio set. Once you have seen one Rey match you have seen them all. You could say that about many wrestlers. Flair, Hart, Hogan to name but three. You must have not seen very many Ric Flair matches then if you put him in the same category as Hogan and Bret. Brett didn’t review the newly released stuff, at least not until quite late on. He didn’t often buy the new ones if I recall. So which situation is better? I can see which one is getting the most hits and user response. I’m guessing you are Brett mix, seen as everyone else was glad to be rid of that douche! Why can’t these be found in Walmart or Kmart in the U.S. I have been all over no one has them! Anybody have any info about this?